Special Offer: Sign-up for the SELECT Black Card and receive VIP treatment at hundreds of hotels, venus, and retailers. Plus, receive thousands in discounts and a dedicated concierge team. See the full review of the SELECT Black Card or apply today and get $50 off your annual membership. WestJet was launched as one of Canada’s first true low-cost-carriers. When WestJet first launched flights, Air Canada and Canadian Airlines were pretty much the only two airlines operating in Canada. Flights were expensive and in 2001, it became even more expensive to fly throughout Canada when Canadian Airlines merged with Air Canada. WestJet, operating as a low-cost-carrier quickly expanded and sold tickets for significantly less than Air Canada, bringing prices down. However, just recently, WestJet announced an end to the airline’s low-cost-carrier structure, instead, launching Swoop, an ultra-low-cost carrier, to fill WestJet’s void. WestJet is transitioning over to operating as a full-service airline. Nowhere is this more apparent than in WestJet’s Plus premium economy/business class hybrid available on all of the airline’s Boeing 737, 767, and 787 aircraft. I booked a one-way ticket via American Express Travel from St. Louis, MO (STL) to Vancouver, BC (YVR) via Minneapolis (MSP) and Winnipeg (YWG). It was a last minute trip that would allow me to cross another airline off my list and get a feel for domestic travel in Canada. While I don’t recommend readers use their American Express Membership Rewards points to book flights directly through the Amex Travel portal, that’s just what I did. Not wanting to spend any cash and having just a few thousands Delta SkyMiles, that left me with booking a ticket with cash. I elected to offset the price of the ticket using my American Express Membership Rewards points. All said and done, the ticket cost $192.75 one-way. I booked via the American Express Travel portal with Delta issuing the ticket which included travel on both Delta (STL-MSP-YWG) and WestJet (YWG-YVR). At the time of booking, I was booked into a standard seat, seat 18F on the WestJet leg, however, I opted to upgrade to Plus at check-in at Winnipeg International Airport. When checking in for my flight to Vancouver, I used a kiosk and was quickly presented with the option to upgrade to WestJet’s Plus cabin. With a flight time of a little under 3 hours, any offer would be considered. At check-in, WestJet Plus was offered for $79 CAD. That meant that I was able to upgrade to WestJet Plus on a nearly three-hour flight for just $59 USD. I highly recommend that when flying WestJet, you opt for an upgrade on longer flights especially if the price to upgrade is under $100 CAD. I arrived in Winnipeg from Minneapolis. Entering Canada from the United States as a US citizen is quite seamless. Though the process is quite straightforward, clearing immigration took a little longer than I had anticipated. There were only two agents to screen non-Canadian passengers, one agent to screen Canadian passengers, and maybe a dozen kiosks. I wasn’t in a huge rush so the wait to clear immigration was more of a nuisance than a major inconvenience. After what might have been the most extensive questioning process I’ve ever experienced at immigration, I made my way to the departures area. I was pleasantly surprised by how modern and airy Winnipeg’s passenger terminal is. The ticketing area is perfectly sized for the airport. Though there were plenty of departing flights, the ticketing area never felt crowded. WestJet’s ticketing area is located on the north end of the concourse near security screening for Canadian and international flights (minus US flights). I decided to use a kiosk as I had planned on grabbing a paper boarding pass, possibly changing my seat, and providing additional contact information. There was an agent that was actively assisting passengers using the kiosks. That’s something that doesn’t happen nearly enough at most US airports. Though I’d assume most travelers know how to use the typical kiosk, I appreciated having an agent proactively monitoring the check-in process in the event I hit a snag. In addition to being proactive and attentive, the WestJet ticketing agent was extremely welcoming and friendly. It was at this time that I decided to upgrade to WestJet Plus. From the moment I booked this ticket, I had always planned on inquiring about an upgrade to WestJet Plus. I set the maximum price I would pay for the upgrade around $75 USD. WestJet’s kiosk interface clearly displayed the option to upgrade to WestJet Plus. At check-in, I wasn’t thrilled to discover that WestJet was charging $75 for the upgrade as that was around the most I had planned on paying. As I reluctantly made my way through the seat selection process for WestJet Plus, it occurred to me that the price displayed was in Canadian dollars, not US dollars. That meant that the price to upgrade was actually around $59. Given the fact that the flight from Winnipeg to Vancouver was around 3 hours, $59 was a steal. After selecting my new seat in WestJet Plus and printing my boarding pass, I made my way to the security screening area. Canada is one of the few countries that seems to take airport security as seriously if not even more seriously than the United States. Screening of carry-on luggage was extensive. It seemed as if agents spent the better part or 30 or 45 seconds viewing passengers luggage as it made its way through the x-ray. Agents also scanned boarding passes twice, once as you entered the screening process and again to verify that a passenger’s ID matched the information on their boarding pass. Agents conducting the screening process were quite possibly the nicest airport security agents I’ve ever come across and that’s saying a lot as I rarely come across TSA screening agents that aren’t professional and polite. I managed to clear Canadian airport security in around 10 minutes. That’s 5x the time it usually takes me to clear TSA PreCheck in the US. It’s also worth noting that Winnipeg is by no means a massive airport, roughly the size of Memphis International Airport in terms of annual passengers. 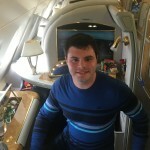 Tip: Use LoungeBuddy to Plan Your Layovers – After I made my way through the screening checkpoint, I checked LoungeBuddy to see what lounges were available in the terminal. LoungeBuddy is one of my favorite tools when traveling, especially if I’m going to be spending an extended period of time waiting for my flight. I highly recommend the app. It’s available for iOS and Android. Make sure you sign-up using the promo code xeDiiDxI3q as you’ll earn $10 USD in credit towards your next LoungeBuddy reservation. At Winnipeg Airport, LoungeBuddy directed me to a Plaza Premium Lounge that was conveniently located directly across from my departure gate. The lounge was accessible thanks to my American Express Platinum Card®. The American Express Platinum Card® gives cardholders (including authorized users) Priority Pass Select membership. Plaza Premium lounges are a part of the Priority Pass network so, all I had to do to access the lounge was present my Priority Pass card and boarding pass. WestJet Plus passengers do not receive lounge access, however, all WestJet passengers can receive 20% off at the Plaza Premium Lounge Winnipeg when they present a valid WestJet boarding pass. Plaza Premium Lounges vary in quality. One of the nicest Priority Pass lounges I’ve ever visited was the Plaza Premium Lounge in Terminal 2 at London Heathrow. However, the Plaza Premium Lounge T2 at LHR is not indicative of every Plaza Premium Lounge. The Plaza Premium Lounge Winnipeg was by no means a super premium lounge. It featured the bare-minimum amenities and at times, was quite crowded. Nevertheless, the lounge featured free alcohol including mixed drinks, hot and cold food options, and fast Wi-Fi. It was a great space to kick back a few drinks and get some work done while I waited for my flight to start boarding. Boarding began right on time. I lined up in the Zone 1 boarding lane as two other passengers with WestJet Gold tags on their bags had done the same. I hate lining up before my zone is called as I always feel like a gate louse. Other passengers in Zone 1 quickly lined up behind me so I assume I made the right move when I lined up early. The two agents working at the gate were very professional and friendly. After passengers requiring additional assistance were called for boarding, Zone 1 and select WestJet elite passengers were welcomed onboard. WestJet’s Boeing 737 fleet features varying Plus products. The Plus branding is actually on its way out, as is WestJet’s current Plus product. All Boeing 737 MAX and select Boeing 737-800 aircraft feature WestJet’s new short and medium-haul premium product. The new product is simply called Premium. Aircraft with WestJet’s new Premium product feature a more traditional business class product in a 2-2 configuration. However, most of WestJet’s fleet of Boeing 737s still feature the original WestJet Plus product in a 3-3 configuration with a blocked middle seat. My flight from Winnipeg to Vancouver was operated by a Boeing 737-700 which featured the original WestJet Plus product. The original WestJet Plus product is pretty much identical to intra-European business class. The seats feature 3-5 inches of additional legroom, 1-2 inches of additional recline, power outlets at each seat, and a blocked middle seat. Looks are somewhat deceiving in the case of the original WestJet Plus product. The seat looks quite cramped and though the width could be improved, the seat was quite comfortable. 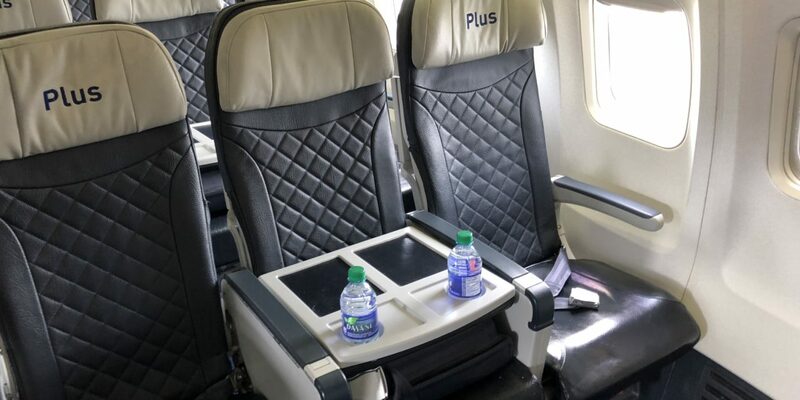 The blocked middle seat also serves as a place to store items you plan on using in-flight and features a cup holder for a bottle of water or in-flight beverage. Additionally, the middle seat’s tray table is still installed and can be used as a shared table between the two passengers seated in a row. Other than seat width, the legroom was great and the seat recline was similar to what’s found on US airlines in narrowbody first class cabins. After a few drinks a meal and a snack, I actually managed to get maybe 45 minutes of rest in what is essentially an upgraded economy class seat. Again, by no means, an unenjoyable premium domestic seat, travelers flying WestJet can look forward to a more traditional business class experience in the coming months as the airline continues to retrofit aircraft with its new Premium product. From the moment I stepped foot on the aircraft, the crew was unbelievably polite, welcoming, professional, and proactive. I say this in all sincerity, the crew on my flight from Winnipeg to Vancouver was quite possibly the nicest and most professional crew I’ve ever had on a flight in years. The purser, who also served as the primary WestJet Plus cabin attendant, seemed to never take a break. She was always out in the aisle refilling drinks, checking on passengers, or assisting other members of the cabin crew. It was refreshing for once to have an entire crew that seemed dedicated to both the safety aspect of the flight but also doing what they could do ensuring passengers enjoyed the flight. Service began once the aircraft hit 10,000 feet. Pre-departure beverages weren’t offered but I wasn’t expecting a PDB to begin with. Service began with a beverage service. All beverages, including premium alcoholic beverages, are free of charge for Plus passengers. I decided to have a mimosa. I was expecting the purser to come back with a plastic cup consisting mostly of orange juice and maybe a spritz of sparkling wine. I was surprised when the purser returned with a tray featuring a full mini-bottle of sparkling wine and a can of orange juice. She handed me both containers and said, “I figured you knew what ratio of wine to orange juice you liked so I’ll let you mix them if you’d like.” Beverages were refilled numerous times throughout the flight and all beverages were served in glassware, not plastic cups. Another aspect of the WestJet Plus experience that will depend on the aircraft type is the in-flight service. WestJet’s Boeing 737 MAX 8 and select Boeing 737-800 feature onboard ovens, allowing in-flight service to include hot meals. On all Boeing 737-700, -600, and most -800 aircraft, ovens are not installed which means WestJet Plus passengers get a free cold pre-packaged meal. It might not sound like the most appetizing option, I wasn’t really expecting much myself but the in-flight meal was quite tasty. Three options were offered to Plus passengers. Plus passengers are presented with a menu upon boarding which includes both available meals and the beverage selection. \I opted for the turkey croissant with pita chips. The meal was served with a chocolate raspberry cake. All meal selections were served pre-packaged. This was quite off-putting at first as pre-packaged meals are usually quite dry and tasteless. This was not the case on my flight. The turkey croissant was super fresh and quite tasty. The cake was also moist and full of flavor. The meal was quite filling. Following the lunch service, I concluded the flight with a vodka tonic with a packet of lime flavoring. An extensive selection of snacks was also offered to Plus passengers. I decided to indulge in some sweet treats against my better judgment. I drifted off to sleep right before we began our descent into the Vancouver area. WestJet is in the midst of a massive change from a low-cost carrier to a full-service carrier. That means that, for now, the passenger experience will vary. This meant for me, I got to experience WestJet’s original premium product, WestJet Plus. At just $56 to upgrade for a three-hour flight, I came away from my first flight on WestJet feeling as if I had just gotten the best deal on an upgrade ever. WestJet Plus and WestJet Premium offer a full-service business class experience but with varying hard products. Even with my flight featuring WestJet Plus versus WestJet Premium, I found the premium WestJet experience to be very enjoyable. Thanks to the outstanding flight crew, tasty in-flight snack, free alcoholic beverages, working wi-fi, power outlets at each seat, and timeliness, I’d go so far as to say WestJet Plus (at least on a 3 hour flight) is an upgrade over what’s offered by American, Delta, and United on domestic flights in first class. Unfortunately, I would imagine that $56 upgrades will probably be a thing of the past as WestJet transitions to a full-service carrier with an actual business class product. WestJet’s new business class product, WestJet Premium takes up more room and features improved catering. It’s meant to compete with Air Canada’s domestic business class product which is often outrageously expensive. That said, if you’re hoping to experience WestJet’s premium cabins, I would do so now rather than later unless you’re willing to spend significantly more compared to standard economy.